Island Hopper Outboards offers a complete line of Kayak Trolling Motor kits that are mounted to the rear (stern or transom) of a kayak to anyone who owns a kayak and wants the freedom to explore, tour and even go fishing further than one normally would venture out, without paddling or breaking a sweat. You steer with your feet for a “hands free” kayaking experience, or steer with a steer with a telescoping handle. 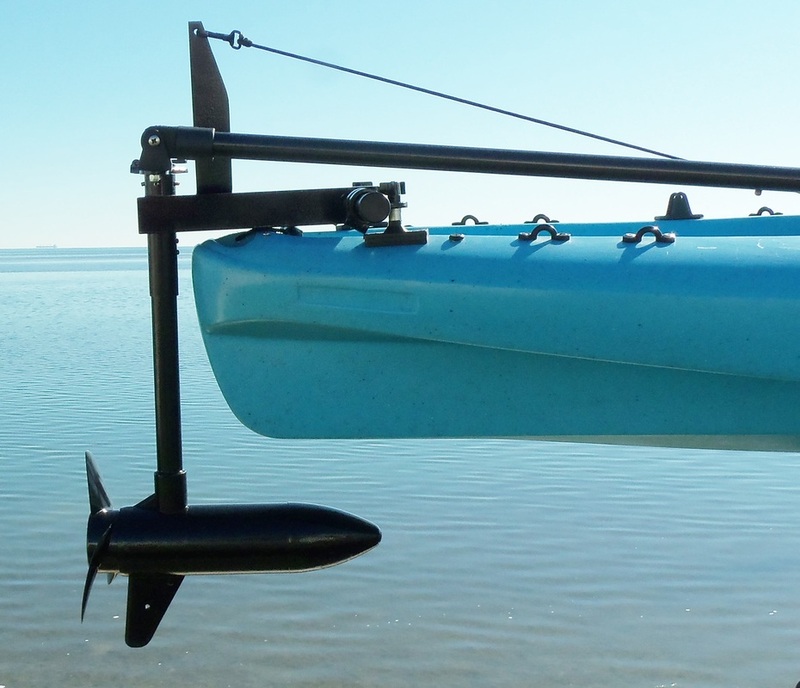 Island Hopper Outboards is the pioneer in motorizing kayaks. Our rear mount kayak trolling motors are a “new addition” to our already “tried and true” full line of trolling motor side mounting kits, drive mounted kits and our exclusive fully loaded Transom Mount Remote Controlled Kayak Trolling System. Transom Mount trolling motors are installed with traditional set up; Steering / Navigating with a Steering Handle (for kayaks with no rudder) or Foot Pedal Navigating (for kayaks with rudders). Our Island Hopper Transom Mount Trolling Motor kits are available for older model and newer model kayaks with rudder systems or without rudder systems. Our Transom Mount Trolling Motor kits are top of the line, waterproof, sealed quiet trolling motors, with kayak specific mounting bracket, remote control and hardware. Transom Mount Trolling Motors are “SEALED & WATERPROOF”, with a full line of both Fresh Water and Salt Water, in 32lbs, 46lbs and 55lbs of thrust. All transom mount trolling motor kits are already assembled, you’ll spend more time kayaking not assembling. The trolling motor can be removed within seconds due to trolling motors quick disconnect connectors. All Transom Mount Trolling Motor kits come standard with “Lifting Feature” at No Extra Up Charge. The lift feature allows you to raise and lower the motor from your seat at any time if needed. If an underwater object is struck, the trolling motor will “kick up” to avoid motor and propeller damage, and glide back into trolling position to continue trolling.